Here in the Pacific Northwest, our autumn colors will be peaking this next week. It's an exciting time for those of us who love this time of year. I got to work last weekend to create some new autumn inspired flower containers. I tried my best to break out of the 'mum' scene, but I do admit to utilizing some violas which isn't terribly creative. 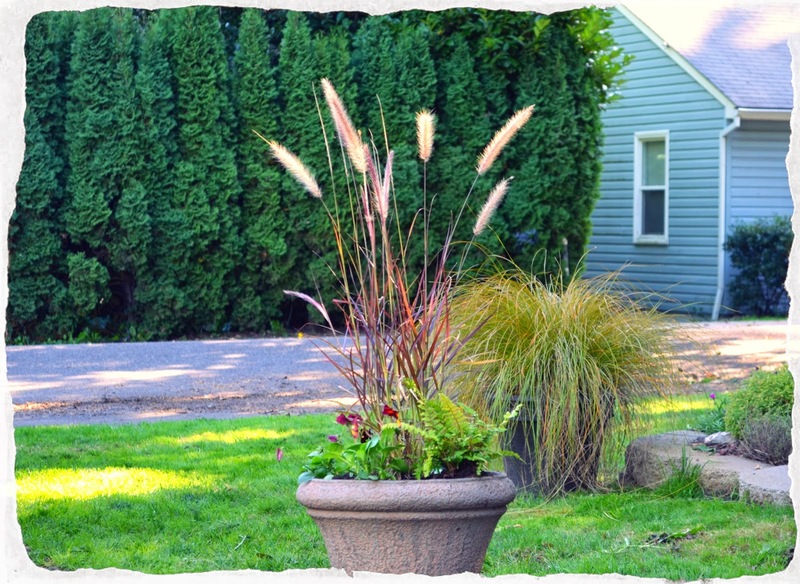 I lucked out and was able to save the fountain grass from my spring summer pots. They were still looking good and I think the eggplant colored foliage is quite nice. I added a Japanese tassel fern to the back side of the container for some texture. The carex testacea in the background container is really quite a stunning plant fall through winter. I love the orange and copper hues. My visit to PDX nursery mid week proved fruitful! They had a decent selection of rudbeckia and grasses. I choose panicum virgatum 'Rostrahlbusch' for it's height and great red / golden colors. The spray of seed heads on top is very romantic. 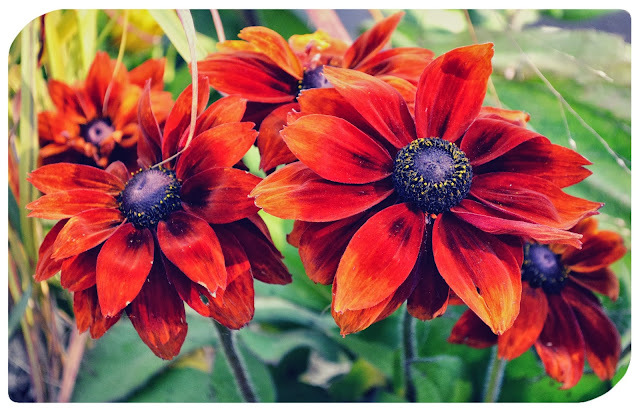 Blooming alongside is rudbeckia, 'Indian Summer', 'Autumn Colors' and 'Cherokee Sunset'. Robust fall colors with a variety of height. The next container will take some time to mature and blend, but I think it has potential. 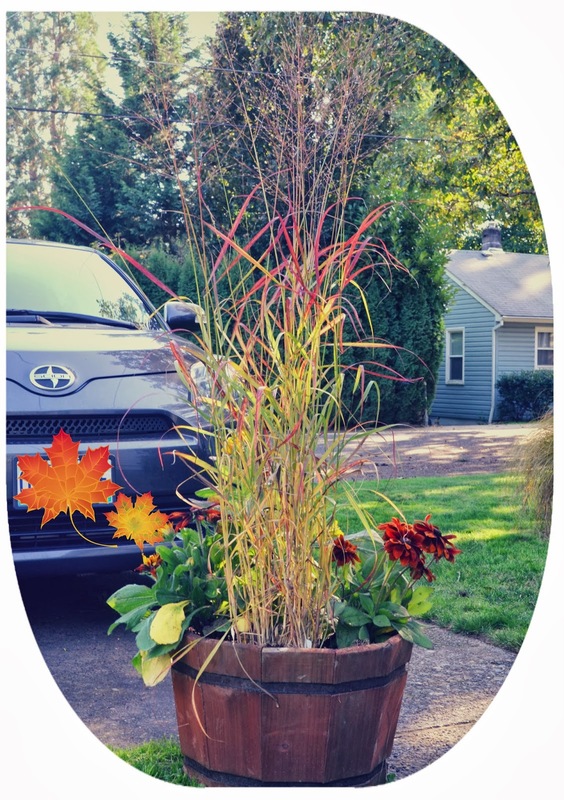 I used a Red Osier Dogwood, which is native to the PNW and had wonderful red foliage in the fall. 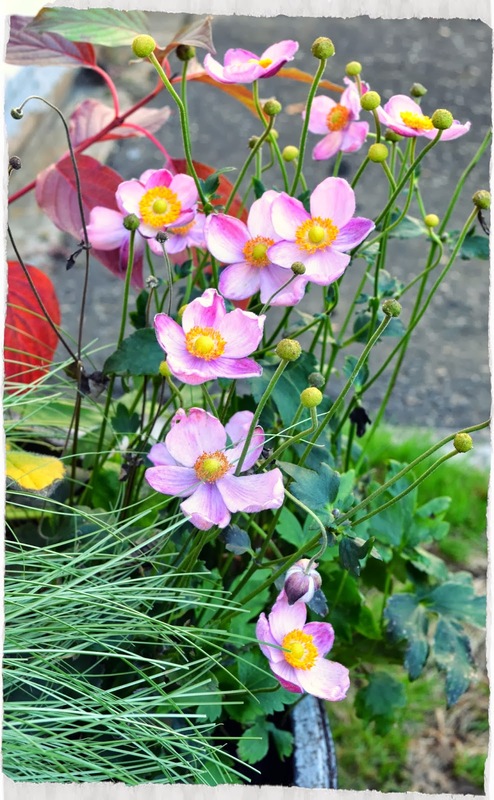 Then, I put an Anemone 'Pretty Lady Susan' on the side. It is blooming so sweetly right now. In front, I have a small, summer blooming heather called' Wickwar Flame'. It's still a baby but, I think it will fill in nicely. It's foliage is a brilliant chartreuse, moving to gold with copper colored tips. I filled the container in with a little grass that I've completely lost the name of. In the back, I tucked in a salvaged little rudbeckia called 'Prairie Eyes' that I picked up on the clearance table at PDX nursery. I'm hoping that it'll bounce back in a pot and add a spot of color next summer. 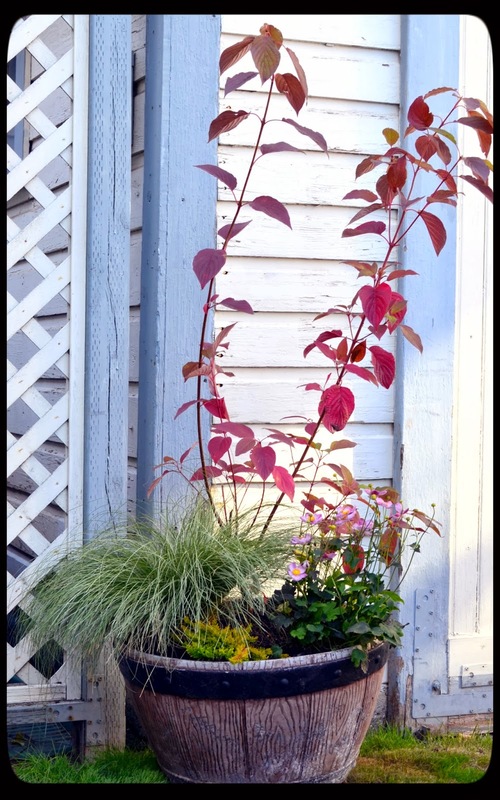 It was fun to enjoy the sunshine on a crisp, autumn day and create my new containers. 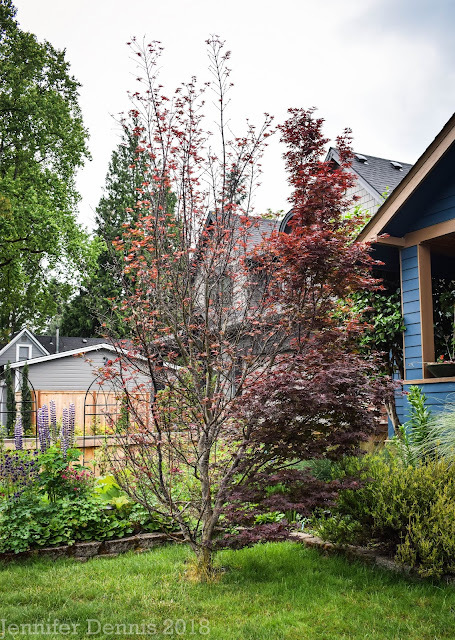 I spent hours working in the yard, moving plants around and finally getting some of my larger, mid-summer plant purchases in the ground, including my new Coral Bark Maple. I think it's going to be a stunner in the years to come. Your containers are looking all dressed up for fall and winter! Glad you're getting to spend some time working in your garden and enjoying the colors of the season! Those containers look really good! With many different plants in each there will be somethng interesting to see over a long period. The Coral Bark Maple tree is fabulous too. That maple is beautiful - Will you leave the containers permanently planted up or change then seasonally? Your coral bark maple is a beauty. You filled your containers very pretty, love the grasses. Good for you to be outside, playing and making pretty! I saw snow up close today, and it made me feel really stressed out about my garden... But also a little excited about the looming ski season! I have grown fond of grasses and yours look very good in the containers. Very pretty. 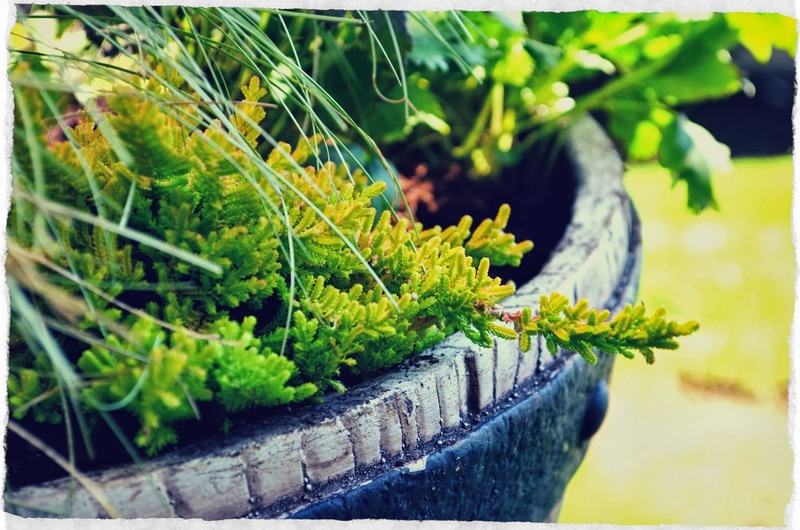 Inspired container plantings. I am still working on developing the knack for instant gratification. My containers always seem to need a bit of time to develop. They reach a moment of perfection, but soon crowd each other out and I find myself back at square one. 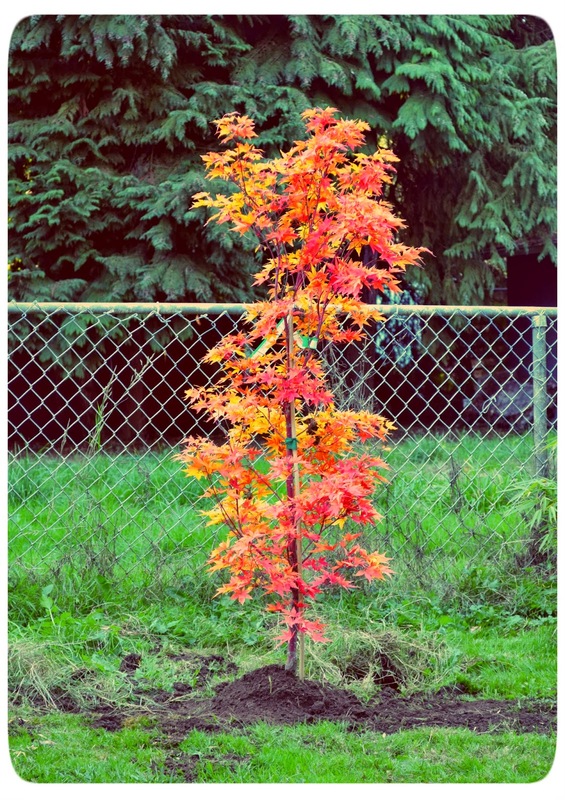 The Coral Bark Maple is a beauty. We went straight to winter this year. I appreciated being able to enjoy your fall displays. Great combinations. I really like the Indian Summer Rudbeckia with the grasses. I didn't even get a chance to get my garlic in and with more snow predicted tomorrow, I don't think it will happen. Your pots and tree say FALL in such a beautiful way. That Japle (as William McClenathan calls them) looks stunning. And the grasses look so cool this time of year, don't they? Enjoy this sunny weekend.